Dan put together a piece on Mo Alie-Cox, a high school basketball player from Northern Virginia and his transition from the public South County Secondary School in Lorton, Va. to Middleburg Academy in rural Middleburg, Va. The story was published on the Lorton, Herndon and Mount Vernon Patch.com sites. 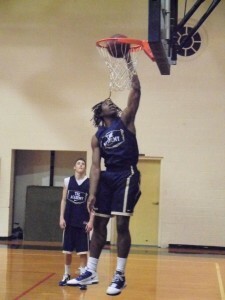 Alie-Cox dunks in practice. Photo by Dan Friedell. The mid-December game comes on a drowsy Saturday afternoon at a private school campus whose students have finished exams for the semester. But the gym is open for a boys’ Varsity basketball game, between the Flint Hill Huskies and the new-look Middleburg Academy Dragons, formerly known as Notre Dame Academy. Fans file into the new-ish gym, the hub of Flint Hill’s expansive athletic complex that sits on a wide swath of Fairfax County land a few wind sprints away from I-66. One can picture drivers sitting in traffic on their way to holiday parties or last-minute shopping at the bustling local malls. There are a few fans who postpone their deal-hunting and happily choose to spend their time, if not their money (the games are free at Flint Hill), watching a more-or-less unremarkable midseason contest. (One college basketball coach in attendance gave the game a 5 on a scale of 1-to-10.) A group of middle-aged men, basketball fans, for sure, but not Middleburg Academy or Flint Hill fans, settle in and take their bulky coats off in the bleachers behind the Dragons’ bench. Just to their right is a cluster of high-school-aged boys, who also could care less how either team performs. They’re here for one reason.